Even though June 3, 1864 at Cold Harbor is best recalled as an infantryman’s fight, as mentioned yesterday, the Fifth Corps artillery launched over eighteen tons of ordnance towards the Confederate lines. While massed batteries, as done with great effect just miles to the south at Malvern Hill in 1862, was not an applicable tactical option, the artillery remained an important combat force on the battlefield. But field fortifications, even basic trenches, provided some mitigation against traditional field artillery. With earth and wood protecting the soldiers from direct fire, the infantry could better withstand any eighteen tons of shot and shell the enemy might care to throw over. At 12 m. 3d of June one section (two pieces)was first placed in position at Cold Harbor, at a distance of about 800 yards from the rebel lines. The charge of powder used was 6 ounces and the length of fuse 15 seconds. The mortars were stationed in a hollow in rear of a belt of woods; 80 rounds were fired. It was reported by the front line of battle and the skirmishers of the Union forces that the shells made great havoc with the enemy, nearly every one exploding in their midst. At 7 p.m., by suggestion of General Barlow, the entire battery withdrew to the rear. At this place the charge of powder was 2 ½ ounces and the length of fuse 7 ½ and 8 seconds. The effect was excellent, and in about half an hour the rebels ceased to fire entirely. 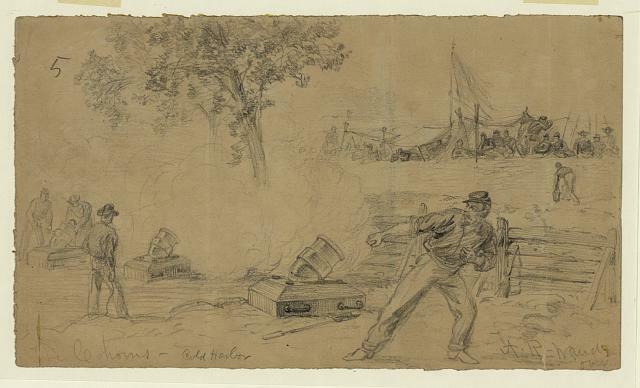 The position was such that the damage caused by the explosion of the shells was plainly discernible; and it was reported furthermore by our skirmishers that great execution ensued and the utmost consternation was visible among the enemy. The battery was highly complimented by Major-General Barlow and Brigadier-General Owen. It was determined to try the effect of the mortar shells upon them and the whole battery delivered its fire, with the same charge of powder and length of fuse as at first. The result was almost instantaneous. Their firing was suppressed and was not resumed for several hours. It is perhaps not improper to observe that, during this affair, 2 rebels were seen to be blown 10 feet into the air, with heads detached. Their companions wildly scattered in every direction, and our infantry (General Owen’s brigade) giving a cheer, delivered a volley with telling effect. Afterward the Confederates treated the mortars with caution. 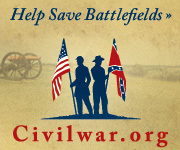 Wood observed, “… that the enemy had fallen back in front of the mortars, leaving but a few skirmishers and sharpshooters in their front line of breast-works.” In effect, the mortars had created a zone in which the Confederates could not operate. While not a large zone, at least that offered some tactical advantage to the Federals. But the Federals would need many more Coehorns if this was to be a useful advantage. … the rebels fired at our forces with good range, using what was supposed to be a 24-pounder howitzer, trained as a mortar. The projectile thrown was spherical case-shot, by the explosion of one of which a man and a mortar were struck, but no serious damage was done to either. A new supply of ammunition having been received, it was decided to silence the rebel machine, if possible. By observing the smoke of their discharges, it was estimated that the distance was about 800 yards. A charge of 6 ounces of powder and a 15-second fuse were used, and after about one dozen discharges the enemy’s machine was silenced. On the 11th the remaining section, in charge of Captain Jones and Lieutenant Moore, was employed in firing at a rebel battery of light 12-pounders, which had opened upon a Union battery a short distance to our left. The mortars were estimated to be about 800 yards from the rebel battery. The charge was 5 ½ ounces and the length of fuse 15 seconds. The first shot struck on the left of the battery on a sand-bag breast-work, tearing a large hole therein. Another exploded inside the parapet, another in rear of the battery, another a short distance to the right. Assisted by the Union battery (light 12-pounders), the enemy’s guns were silenced. After this a few shells were thrown into a house almost in front of the mortars and 300 yards distant. The charge was 3 ½ ounces and the fuse 10 seconds in length. The house was a refuge for sharpshooters. One shell broke through the roof and exploded in the house. No more shots were observed to come from that locality. With both armies remaining in close proximity for more than a week, the mortars were an idea weapon to use. But there were precious few of them at the front. Back in Massachusetts, Ames Manufacturing had a batch of fifty of the little mortars ready for inspection. More Coehorns were on the way. April 17, Sunday. We have had another wet spell since Friday; yesterday it rained steadily. The spring is more backward and colder than it was at this time last year; much as in 1862. I trust we are not going to have a whole summer of rain as we had then…. Those living in Virginia today might relate. Since Monday evening, the weather’s been almost wintery cold, with frost warnings. Though with perhaps less rain. But close enough for Mother Nature’s 150th. On Friday I got the order assigning the battery of heavy artillery to my command. They have had terribly bad weather to get their camp in order, which has come very hard on them as over half the men are recruits, and the rest have always been accustomed to garrison duty. The Fourth New York Heavy was originally commanded by a brother of General [Abner] Doubleday, who I believe proved to be worthless; then de Russy was colonel and now Tidball; the two last ought to have made a good regiment of it. They look very much like rats drowned out of their holes as I pass the camp…. The “battery” was according to the organizational tables actually a battalion. Specifically 2nd Battalion, 4th New York Heavy Artillery under Major William Arthur. The battalion consisted of Companies D, H, K, and E. In their regimental history, the chapter detailing these assignments in the Army of the Potomac carries the title “Good-bye, Cannon.” As Brigadier-General Henry Hunt had requested earlier in the winter, the 2nd Battalion was assigned to support the field batteries providing details for guard and other duties. They brought no heavy artillery pieces of their own to Wainwright’s brigade. William was the brother of President Chester A. Arthur.